Why does the record industry have such a problem with the term progressive rock? If you look at album sales, artists ranging from Pink Floyd to Yes to Rush to Genesis have sold millions of records, and they continue to sell classic back-catalog works in greater numbers than many newer artists. Even new releases from veteran groups have strong sales – Rush’s spring 2007 release, Snakes & Arrows, sold almost 100,000 units in its first week! Progressive rock isn’t purely the domain of older bands, though. Artists ranging from Radiohead to Coheed & Cambria to Muse can easily be considered progressive, despite their labels’ attempt to call them “alternative.” And if we crank up the distortion and mix in the influence of heavy metal, Dream Theater currently rule the progressive metal universe (which really didn’t even exist until they put this sub-genre on the map in the first place). Enter Porcupine Tree. Musically, they are best poised to become the Pink Floyd of a new generation. With spacey songs and electronic textures surrounding the guitars, listening to a Porcupine Tree album takes you on a wild rollercoaster of emotion, attitude, and sound. Unlike other artists who may be mellow and moody from start to finish, there’s also a side of this band that loves hard rock and metal, and the band have found a way to combine driving, heavy guitars with the moodiness and darkness of their mellower tunes. In keeping with the most talented progressive rock bands, musicianship is superb within Porcupine Tree. 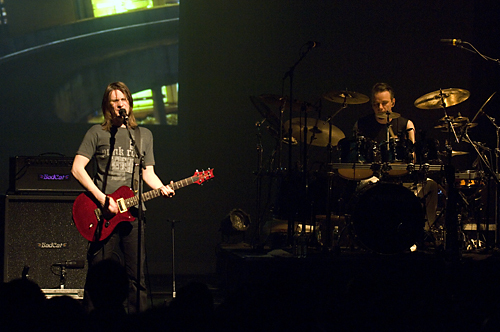 Singer/guitarist Steven Wilson is supported by keyboardist Richard Barbieri, bassist Colin Edwin, and drummer Gavin Harrison. On tour, guitarist/singer John Wesley regularly joins the group to fill in additional parts for the live performances. For those of you still unfamiliar with Porcupine Tree music, their songs have intricate arrangements that feature use of various time signatures, numerous layers of sound that combine electric guitars, acoustic guitars, synthesizers, bass, drums, and vocal harmonies. The songs, often times spanning many minutes in length, strike a delicate balance between dark and dissonant musical tones and melodic vocal harmonies. The music is highly listenable and commercially appealing compared to traditional jazz music or some of progressive rock’s more extreme songwriting. There are choruses you’ll sing along with, melodies that stick in your head, and lyrics that you’ll contemplate for a very long time. Typically, the albums are themed (remember concept albums? ), and there is a definite flow from start to finish that helps to tell a story. Forget stripped-down power trios – Porcupine Tree serve up a wall of sound that you can get really lost in. Close your eyes, pop on a set of nice headphones, and get lost in their albums the way good theater can immerse all of your senses in the experience. Or, pick up one of their 5.1 surround mix CDs to really immerse yourself in the sonic journey. The mostly-English band has been gaining significant popularity in the United States principally since their album, In Absentia, was released in 2002. The first single, “Blackest Eyes,” combined elements of Zeppelin-esque metal riffs with Moody Blues melodies and we were forever hooked. But the story hardly started there for this band. “I never really intended for it to be anything more than a one-off kind of studio project,” Steven Wilson explained. As the principle songwriter, guitarist, vocalist, producer and engineer behind Porcupine Tree, the band started off as something of a joke, pretending to be a fictitious classic progressive rock band from the Seventies, and it was the brainchild of Steven and one other friend – hardly a rock band. But as with many clever jokes, people took the band seriously, which led to more recordings, more sales, and ultimately the addition of other musicians to create a real band lineup. A fascinating history of the band’s conception can be found online in the Wikipedia entry at this link. All aspects of the creative output from Porcupine Tree are conceptualized as a whole, starting with the music and lyrics, expanding to the creatively illustrated CD packaging/inserts, and culminating in videos and films that support the band in their live shows. Currently touring the world in support of their 2007 album, the chilling Fear of a Blank Planet, we caught spectacular shows in New York City and Chicago. If you missed Porcupine Tree on this tour (they’re in Europe this summer), last year’s concert DVD, Arriving Somewhere… is one of the finest concert DVDs we’ve seen, and it would make a fitting introduction to this band. We had a chance to talk with mastermind Steven Wilson and his incredible drummer, Gavin Harrison, before the tour left North America. To read our review of their latest CD, Fear of a Blank Planet, view our May CD Reviews here. To read our review of the concert DVD, Arriving Somewhere..., view our JaunaryDVD Reviews here.